Citation Information: J Clin Invest. 2006;116(3):715-723. https://doi.org/10.1172/JCI26091. Antagonists to α4 integrin show promise for several autoimmune and inflammatory diseases but may exhibit mechanism-based toxicities. We tested the capacity of blockade of α4 integrin signaling to perturb functions involved in inflammation, while limiting potential adverse effects. 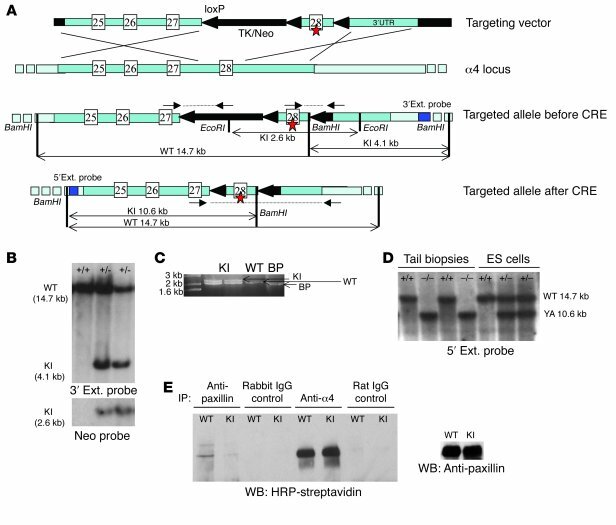 We generated and characterized mice bearing a Y991A mutation in α4 integrin [α4(Y991A) mice], which blocks paxillin binding and inhibits α4 integrin signals that support leukocyte migration. In contrast to the embryonic-lethal phenotype of α4 integrin–null mice, mice bearing the α4(Y991A) mutation were viable and fertile; however, they exhibited defective recruitment of mononuclear leukocytes into thioglycollate-induced peritonitis. α4 Integrins are essential for definitive hematopoiesis; however, the α4(Y991A) mice had intact lymphohematopoiesis and, with the exception of reduced Peyer’s patches, normal architecture and cellularity of secondary lymphoid tissues. We conclude that interference with α4 integrin signaling can selectively impair mononuclear leukocyte recruitment to sites of inflammation while sparing vital functions of α4 integrins in development and hematopoiesis. (A) Representation of targeting vector, WT α4 locus, and the targeted allele before and after CRE recombination (see Methods for details). The tyrosine 991 (star) was mutated into an alanine, along with the creation of a unique restriction site for Eco47III. (B) Southern blot analysis of genomic DNA showing correct targeting of the α4 allele. Genomic DNA was isolated from R1 ES cells, digested with BamHI, and hybridized with the 3′ probe. Probing the same Southern blot with a specific probe for Neo revealed 1 targeted band at the expected size, indicating that there was a single homologous recombination event. (C) PCR analysis of genomic DNA following CRE recombination. Two types of recombination occurred, either between the 2 most external loxP sites (by-product; BP) knocking out both the selection cassette and exon 28, or between the loxP sites flanking the selection cassette (knock-in; KI), selectively removing the cassette. Knock-in clones were subsequently used for blastocyst injection. (D) Southern blot analysis of mouse tail genomic DNA showing correct targeting of the α4 allele. Two lines were obtained. WT, heterozygotes, and homozygotes were confirmed by Southern blot using BamHI-digested DNA and hybridizing with the 5′ external probe. Targeted band at the expected size [α4(Y991A) (YA), 10.6 kb; WT, 14.7 kb] was obtained. (E) Coimmunoprecipitation of α4 integrin with paxillin. Paxillin was immunoprecipitated, and coimmunoprecipitated α4 integrin was visualized by blotting for biotin after separation in SDS-PAGE gel. Immunoprecipitated paxillin was detected by anti-paxillin antibody.